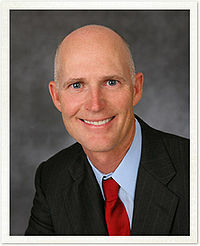 Richard Lynn "Rick" Scott (born December 1, 1952), is the junior Senator from Florida, after successfully serving as its governor. Before running for office, he founded both Columbia Health Care (which later merged with Hospital Corporation of America) and Solantic Corporation (a chain of urgent care facilities). He also started Conservatives for Patients' Rights to defend the idea of heathcare based on free market principles. Although appearing somewhat conservative in winning the Republican primary, general election, and in his first few months in office, as he began focusing on his desire to be reelected in 2014 he became increasingly liberal, even to the point of attempting to impose ObamaCare's Medicaid expansion on his State, and he caved to the gun control lobby by proposing more gun laws. Born in Bloomington, Illinois, Scott grew up in Kansas City, Missouri. He is the son of a truck driver and a clerk with JC Penney. After his military service, he attended the University of Missouri-Kansas City, where he earned a bachelor's degree in business administration. He received his law degree from Southern Methodist University. Scott enlisted in the United States Navy after a year at a community college. He served as radar man aboard the USS Glover. After a vigorous campaign, Rick Scott defeated Bill McCollum 46% to 43% in the primary election. From there, Rick Scott went on to defeat Alex Sink 48.87% to 47.72% in the general election. Scott won re-election in 2014. As Florida Governors are term-limited to two, four-year terms, he has announced his candidacy for the United States Senate, seeking to unseat Democrat incumbent Bill Nelson. In June 2017, Scott signed an expanded "stand your ground" bill into law. However, in February 2018, Scott caved to the gun control lobby and began advocating for additional gun control laws. On March 9, 2018, Scott fully caved by signing a bill that enacted several gun controls, including raising the minimum age of gun purchases from 18 to 21, allowing judges to confiscate firearms from people they consider a threat, and requiring a three-day waiting period for purchases. Rick Scott is a Christian who helped found the Naples Community Church in 2006. He married his high school sweetheart, Ann, around 1972. The couple has two daughters, Jordan and Allison. ↑ Primary Results - Florida. The New York Times (2010-08-24). Retrieved on 2010-11-27. ↑ Bowden, John (June 6, 2017). Florida governor signs strengthened 'stand your ground' bill into law. The Hill. Retrieved June 9, 2017. ↑ Hawkins, Awr (February 23, 2018). Gov. Rick Scott Pushes Firearm Confiscation Orders, Opposes Arming Teachers for School Safety. Breitbart News. Retrieved February 23, 2018. Hawkins, Awr (March 9, 2018). Gov. Rick Scott Signs $400 Million Gun Control Bill: Includes Firearm Confiscation, Waiting Periods. Breitbart News. Retrieved March 9, 2018. McLaughlin, Seth (March 9, 2018). Florida Gov. Rick Scott signs school safety bill to tighten gun laws. The Washington Times. Retrieved March 9, 2018. Basu, Zachary (March 9, 2018). Florida tightens gun laws in defiance of NRA. Axios. Retrieved March 9, 2018. Klukowski, Ken (March 9, 2018). NRA Sues: New Florida Gun Control Law Violates Second Amendment. Breitbart News. Retrieved March 9, 2018. This page was last modified on 7 February 2019, at 14:57.